With skinwalkers becoming the subjects of popular books and recently, movies, it is fair to ask about their origins. In August 1996, a team of scientists arrived on a remote ranch in NE Utah to investigate a bizarre litany of phenomena; including unidentified flying objects, animal mutilations, paranormal and poltergeist occurrences that appeared to erupt almost on a nightly basis. The list went on and on. The first piece of information the team learned from local people was that the ranch lay “on the path of the skinwalker”. Was the skinwalker responsible for the weird happenings on this ranch? What followed was a multi-year odyssey into the dark unknown as the science team tried to pursue, measure and photograph the elusive “skinwalker”. The complete account of the unprecedented research project is published in the book “Hunt for the Skinwalker”. In the religion and cultural lore of Southwestern tribes, there are witches known as skinwalkers who can alter their shapes at will to assume the characteristics of certain animals. Most of the world’s cultures have their own shapeshifter legends. The best known is the werewolf, popularized by dozens of Hollywood movies. European legends as far back as the 1500’s tell stories about werewolves. (The modern psychiatric term for humans who believe they are wolves is lycanthropy.) The people of India have a were- tiger legend. Africans have stories of were-leopards and were- jackals. Egyptians tell of were-hyenas. In the American Southwest, the Navajo, Hopi, Utes, and other tribes each have their own version of the skinwalker story, but basically they boil down to the same thing–a malevolent witch capable of transforming itself into a wolf, coyote, bear, bird, or any other animal. The witch might wear the hide or skin of the animal identity it wants to assume, and when the transformation is complete, the human witch inherits the speed, strength, or cunning of the animal whose shape it has taken. For the Navajo and other tribes of the southwest, the tales of skinwalkers are not mere legend. Just ask Michael Stuhff. A Nevada attorney, Stuhff is likely one of the few lawyers in the history of American jurisprudence to file legal papers against a Navajo witch. He has often represented Native Americans in his practice. He understands Indian law and has earned the trust of his Native American clients, in large part because he knows and respects tribal religious beliefs. As a young attorney in the mid-70s, Stuhff worked in a legal aid program based near Genado Arizona. Many, if not most, of his clients were Navajo. His legal confrontation with a witch occurred in a dispute over child custody and financial support. His client, a Navajo woman who lived on the reservation with her son, was asking for full custody rights and back child support payments from her estranged husband, an Apache man. At one point during the legal wrangling, the husband got permission to take the son out for an evening, but didn’t return the boy until the next day. The son later told his mother what had transpired that night. According to the son, he spent the night with his father and a “medicine man.” They built a fire atop a cliff and, for many hours, the medicine man performed ceremonies, songs, and incantations around the fire. As dawn broke, the three traveled into a wooded area near a cemetery, where they dug a hole. Into the hole, the medicine man deposited two dolls made of wood. One of the dolls was made of dark wood, the other of light wood. It was as if the two dolls were meant to represent the mother and her lawyer. Although Stuhff wasn’t sure how seriously to take the news, he recognized that it certainly didn’t sound good, so he sought out the advice of a Navajo professor at a nearby community college. Stuhff thought about a way to let the husband know that he had found out about the ceremony, so he filed court papers that requested an injunction against the husband and the unknown medicine man, whom he described in the court documents as “John Doe, A Witch.” The motion described in great detail the alleged ceremony. The opposing attorney appeared extremely upset by the motion, as did the husband and the presiding judge. The opposing lawyer argued to the court that the medicine man had performed “a blessing way ceremony,” not a curse. But Stuhff knew that the judge, who was a Navajo, could distinguish between a blessing ceremony, which takes place in Navajo hogans (homes), and what was obviously a darker ceremony involving lookalike dolls that took place in the woods near a cemetery. The judge nodded in agreement when Stuhff responded. Before the judge could rule, Stuhff requested a recess so that the significance of his legal motion could sink in. The next day, the husband capitulated by agreeing to grant total custody to the mother and to pay all back child support. As Zimmerman suggests, the flip side of the skinwalker coin is the power of tribal medicine men. Among the Navajo, for instance, medicine men train over a period of many years to become full- fledged practitioners in the mystical rituals of the Dine’ (Navajo) people. The U.S. Public Health Service now works side by side with Navajo medicine men because the results of this collaboration have been proven, time and again, in clinical studies. The medicine men have shown themselves to be effective in treating a range of ailments. But there is a dark side to the learning of the medicine men. Witches follow some of the same training and obtain similar knowledge as their more benevolent colleagues, but they supplement both with their pursuit of the dark arts, or black magic. By Navajo law, a known witch has forfeited its status as a human and can be killed at will. The assumption is that a witch, by definition, is evil. “Witchcraft was always an accepted, if not widely acknowledged part of Navajo culture,” wrote journalist A. Lynn Allison. “And the killing of witches was historically as much accepted among the Navajo as among the Europeans.” Allison has studied what she calls the “Navajo Witch Purge of 1878” and has written a book on the subject. In that year, more than 40 Navajo witches were killed or “purged” by tribe members because the Navajo had endured a horrendous forced march at the hands of the U.S. Army in which hundreds were starved, murdered, or left to die. At the end of the march, the Navajo were confined to a bleak reservation that left them destitute and starving. The gross injustice of their situation led them to conclude that witches might be responsible, so they purged their ranks of suspected witches as a means of restoring harmony and balance. Tribe members reportedly found a collection of witch artifacts wrapped in a copy of the Treaty of 1868 and “buried in the belly of a dead person.” It was all the proof they needed to unleash their deadly purge. In the Navajo world, where witchcraft is important, where daily behavior is patterned to avoid it, prevent it, and cure it, there are as many words for its various forms as there are words for various kinds of snow among the Eskimos. If the woman thought he was adan’ti, she thought he had the power of sorcery-to convert himself into animal form, to fly, to perhaps become invisible. Very specific ideas. Where had she gotten them? Hillerman has been harshly criticized by some Navajo for bringing unwanted attention to the subject of skinwalkers. “No one who has ever lived in the Navajo country would ever make light of this sinister situation,” wrote one critic after Hillerman’s book was produced as a movie that aired on PBS in 2003. We know from personal experience that is it extremely difficult to get Native Americans to discuss skinwalkers, even in the most general terms. Practitioners of adishgash, or witchcraft, are considered to be a very real presence in the Navajo world. Few Navajo want to cross paths with naagloshii (or yee naaldooshi), otherwise known as a skinwalker. The cautious Navajo will not speak openly about skinwalkers, especially with strangers, because to do so might invite the attention of an evil witch. After all, a stranger who asks questions about skinwalkers just might be one himself, looking for his next victim. One story told on the Navajo reservation in Arizona concerns a woman who delivered newspapers in the early morning hours. She claims that, during her rounds, she heard a scratching on the passenger door of her vehicle. Her baby was in the car seat next to her. The door flung open and she saw the horrifying form of a creature she described as half-man, half-beast, with glowing red eyes and a gnarly arm that was reaching for her child. She fought it off, managed to pull the door closed, then pounded the gas pedal and sped off. To her horror, she says, the creature ran along with the car and continued to try to open the door. It stayed with her until she screeched up to an all-night convenience store. She ran inside, screaming and hysterical, but when the store employee dashed outside, the being had vanished. Outsiders may view the story skeptically, and any number of alternative explanations might be suggested, but it is taken seriously on the Navajo reservation. Although skinwalkers are generally believed to prey only on Native Americans, there are recent reports from Anglos claiming they had encountered skinwalkers while driving on or near tribal lands. One New Mexico Highway Patrol officer told us that while patrolling a stretch of highway south of Gallup, New Mexico, he had had two separate encounters with a ghastly creature that seemingly attached itself to the door of his vehicle. During the first encounter, the veteran law enforcement officer said the unearthly being appeared to be wearing a ghostly mask as it kept pace with his patrol car. To his horror, he realized that the ghoulish specter wasn’t attached to his door after all. Instead, he said, it was running alongside his vehicle as he cruised down the highway at a high rate of speed. The officer said he had a nearly identical experience in the same area a few days later. He was shaken to his core by these encounters, but didn’t realize that he would soon get some confirmation that what he had seen was real. While having coffee with a fellow highway patrolman not long after the second incident, the cop cautiously described his twin experiences. To his amazement, the second officer admitted having his own encounter with a white-masked ghoul, a being that appeared out of nowhere and then somehow kept pace with his cruiser as he sped across the desert. The first officer told us that he still patrols the same stretch of highway and that he is petrified every time he enters the area. Once Caucasian family still speaks in hushed tones about its encounter with a skinwalker, even though it happened in 1983. While driving at night along Route 163 through the massive Navajo Reservation, the four members of the family felt that someone was following them. As their truck slowed down to round a sharp bend, the atmosphere changed, and time itself seemed to slow down. Then something leaped out of a roadside ditch at the vehicle. The father described as a fearless man who had served two tours in Vietnam, turned completely white, the blood drained from his face. The hair on his neck and arms stood straight up, like a cat under duress, and noticeable goose bumps erupted from his skin. Although time seemed frozen during this bizarre interlude, the truck continued on its way, and the family was soon miles down the highway. A few days later, at their home in Flagstaff, the family awoke to the sounds of loud drumming. As they peered out their windows, they saw the dark forms of three “men” outside their fence. The shadowy beings tried to climb the fence to enter the yard but seemed inexplicably unable to cross onto the property. Frustrated by their failed entry, the men began to chant in the darkness as the terrified family huddled inside the house. The story leaves several questions unanswered. If the beings were skinwalkers, and if skinwalkers can assume animal form or even fly, it isn’t clear why they couldn’t scale a fence. It is also not known whether the family called the police about the attempted intrusion by strangers. The daughter, Frances, says she contacted friend, a Navajo woman who is knowledgeable about witchcraft. The woman visited the home, inspected the grounds, and offered her opinion that the intruders had been skinwalkers who were drawn by the family’s “power” and that they had intended to take that power by whatever means necessary. She surmised that the intrusion failed because something was protecting the family, while admitting that it was all highly unusual since skinwalkers rarely bother non-Indians. The Navajo woman performed a blessing ceremony at the home. Whether the ceremony had any legitimacy or not, the family felt better for it and has had no similar experiences in the ensuing years. This disturbing account is not offered as definitive proof of anything, particularly since we have not personally interviewed the witnesses. It is presented only as an illustration of the intense fear and unsettling descriptions that permeate skinwalker lore, and which are accepted at face value by the Native Americans for whom the skinwalker topic is not just a spooky children’s story. So, exactly how and when did the skinwalker legend intersect with the Gorman ranch in northeastern Utah? Retired teacher and UFO researcher Junior Hicks says his friends in the Ute tribe believe the skinwalker presence in the Uinta Basin extends back at least 15 generations. The Utes, described by historians as a fierce and warlike people, were sometimes aligned with the Navajo against common enemies during the 1800’s. But the alliance didn’t last. When the Utes first acquired horses from the Spanish, they enthusiastically embraced the Spanish example by engaging in the slave trade. They reportedly abducted Navajos and other Indians and sold them in New Mexico slave markets. Later, during the American Civil War, some Ute bands took orders from Kit Carson in a military campaign against the Navajo. According to Hicks, the Utes believe the Navajo put a curse on their tribe in retribution for many perceived transgressions. And ever since that time, Hicks was told, the skinwalker has plagued the Ute people. Hicks told us that the Indians say they see them a lot. “When they go out camping,” he says, “they sprinkle bark around their campsites and light it as protection against these things. But it’s not just Indians. Whites see them, too.” Like his Ute neighbors, Hicks sometimes uses the terms skinwalker and Sasquatch interchangeably. He says he’s seen photographs of the telltale huge footprints often associated with Bigfoot, taken in the vicinity of the Gorman ranch. But whether it was a run-of-the-mill Sasquatch or a far more sinister skinwalker isn’t always clear, even to those who accept he existence of both. We also conducted an interview with a Ute man who worked as a security officer for the tribe. He provided us with details about his own encounter with a Bigfoot or skinwalker. Brandon Ware (not his real name) received his police training at an academy associated with the Bureau of Indian Affairs. He says he was working the 10:00 p.m. to 4:00 a.m. shift, guarding a tribal building near a part of the reservation known as Little Chicago. Between midnight and 1:00 in the morning, Ware walked up to check on the building and noticed that the guard dogs inside were calm but intently staring through a window at something outside. They weren’t barking, he said, just looking. Ware says that when the creature realized it was being observed, it briefly looked over at Ware, then vaulted over a short wall that surrounded the patio area outside the building. He says it took off running toward the Little Chicago neighborhood, crashing into garbage cans as it moved past the homes, and generating a cacophony of loud barking by every dog in the immediate area. Ware says he then went into the building and telephoned another on-duty officer who was nearby. By the time Ware left the building, the other officer had pulled up in his patrol car. Ware provided us with further details about what he had seen. His initial impression was of something dark and round. But he says that when the creature stood erect to vault over the patio wall, it appeared to be “huge.” Ware was carrying a large flashlight at the time of the encounter. He says he was using the flashlight just minutes before the encounter while checking the doors of the building, but when he tried to use it to illuminate the creature, the light wouldn’t turn on. When the creature took off running down the hill, the flashlight clicked back on. Ware described the creature’s eyes as being “coal red” and unusually large. He isn’t sure whether the headlights of the patrol car might have affected his perception of the beast’s eye color, but tends to doubt it. He has no doubt about the presence of the beast itself. “We got out there to go look and we had shotguns and pistols and everything. We were going to blow him away,” Ware admits. When pressed for his opinion of what he had seen, whether it might have been a Sasquatch or even a skinwalker, Ware’s response seemed to draw a distinction between the two, but the distinction became blurry as the conversation progressed and Ware explained his understanding of tribal lore. “Sasquatch, he’s an old man, an old man that lives on a mountain,” he explained. “He just comes in and looks at people and then he goes back out again. He just lives there all his life, never takes care of himself, and just smells real bad. Almost like, almost like that guy, like he is dirty, dirty human being smell is what it smelled like…a real deep, bad odor….It smelled like dirty bad underarms…The closer I got, the worse the smell got.” Could the creature he saw have been a skinwalker? Ware said that skinwalker sightings among the Utes are not uncommon. He told us of an encounter with two shapeshifters near the Gorman ranch. The figures he described are so unusual, so far outside our own concept of reality as to be almost comical, like something out of a Saturday morning cartoon. One local who saw them in the road in Fort Duchesne described them as humans with dog heads smoking cigarettes. But Ware was perfectly serious in his description. He certainly did not bare his soul for comic effect and we have no interest in making light of his story. For him, and for many others, skinwalkers are as real as the morning sun or the evening moon. They are a part of everyday life, and they most certainly are integral to the story of the Gorman ranch. Could the Utes have used the skinwalker curse as an all- encompassing explanation for their assorted tribal misfortunes, as Banyshek asks? Or are they relying on the legend as an umbrella explanation for the wide range of paranormal events that have been reported in the vicinity of their lands for generations–in particular, in the vicinity of the ranch? If a skinwalker really is a shapeshifter, capable of mind control and other trickery, might it also have the ability to conjure up nightmarish visions of Bigfoot or UFOs? 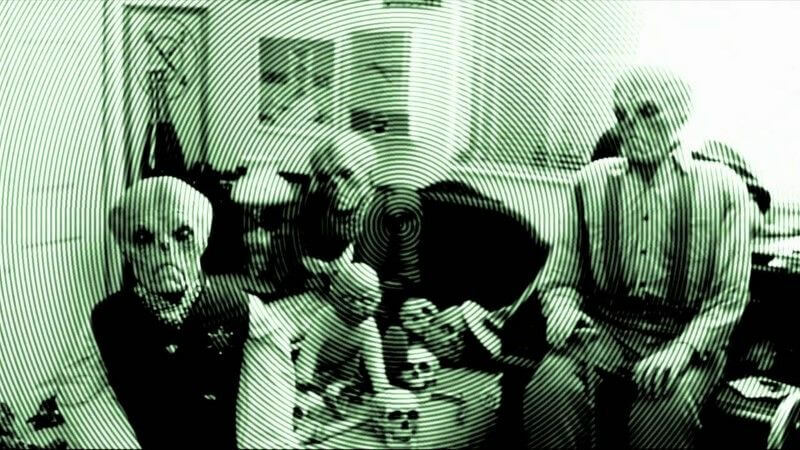 Could it steal and mutilate cattle, incinerate dogs, generate images of monsters , unknown creatures, or extinct species, and could it also frighten hapless residents with poltergeist-like activity? At the very least, the skinwalker legend might be a convenient way for the Utes to grasp a vast menu of otherwise inexplicable events, the same sort of events that might stymie and confuse a team of modern scientists. One thing is sure, by summer 2007 it is obvious that the legend of skinwalkers is entering popular culture in ways not seen before.